Browse by genre. Tap one of the categories (Music, Movies, or TV Shows). Tap Genres to refine the list. If you know what you’re looking for, tap Search. Enter info in the search field, then tap Search again. Discover great new music on iTunes Radio. When you listen to iTunes Radio and hear a song you like, you can connect to iTunes Store to purchase it, add it to your wish list, or discover similar music. See iTunes Radio. Preview a song or video. Tap it. Tired of tapping More? To rearrange the buttons, tap More, then tap Edit. 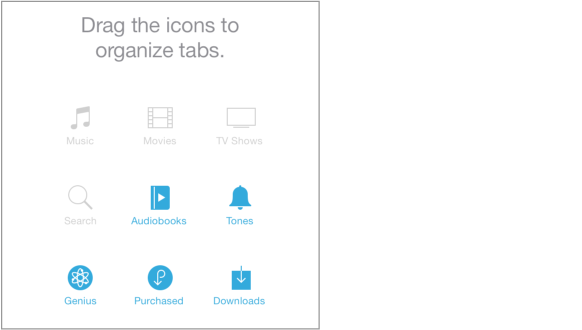 To replace an icon, drag another icon over the one you want to replace. Then tap Done.